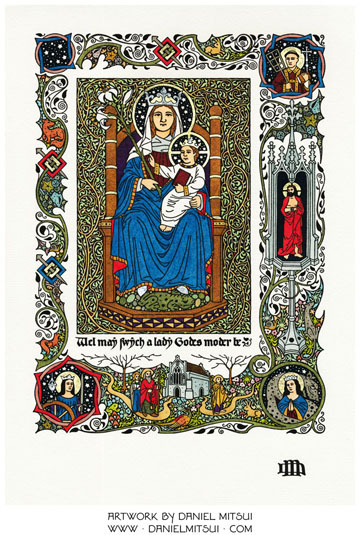 Happy Feast of Our Lady of Walsingham to members of the Ordinariate across the Pond. I’ll take this occasion to remind you of the image of Our Lady by the Catholic sacred artist Daniel Mitsui. The 7″ x 10″ print is ready for ordering HERE. Those saints in the corners are Catherine of Alexandria, Margaret of Antioch and Lawrence of Rome. The print was made on a Heidelberg Windmill press at Rohner Letterpress (Chicago, IL). The printing method involves pressing a piece of paper against a hard plate whose raised surfaces are inked; this is essentially the method invented by Gutenberg that remained dominant until the 20th century. Graphic Chemical & Ink (Villa Park, IL) supplied a traditional printing ink made from linseed oil & furnace black. The paper was handmade from cotton rag pulp at Twinrocker Handmade Papers (Brookston, IN). It is a laid paper, which means that it has a slight ribbed texture, from the wires in the papermaking mould. Laid paper was the only type of paper manufactured in Europe until the mid-18th century. A squirrel! I hate squirrels, but there it is. A nice reminder that her shrine is a pilgrimage place. The Middle English at the bottom is from a 15th c. poem in honor of Our Lady. You have to go to his site to read that…. yes… just go there. I have an earlier version of this, on vellum, but he has a reworked it. The printing is crisp. It jumps out at you. Very nice. Lot’s of stuff to consider… go have a look! 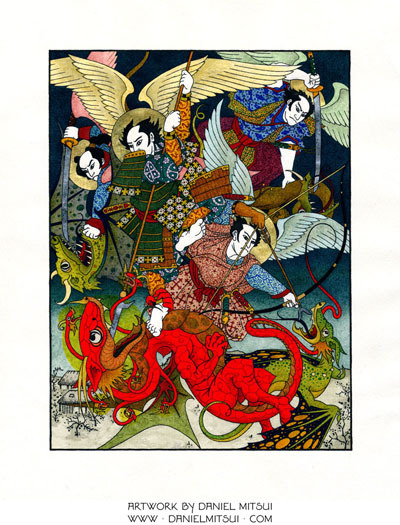 One piece I saw when rummaging around was a fascinating version of the Battle of Heaven with the archangels as Japanese samurai opening a can of whoopass on Ol’ Scratch. Very cool. Feasts of angels are upon us at the end of September and the beginning of October. This entry was posted in Our Solitary Boast, The Campus Telephone Pole and tagged O.L. of Walsingham, Ordinariate of Our Lady of Walsingham. Bookmark the permalink. I syng of a myden that is makeles. King of alle kynges to here Sone che ches. As dew in Aprylle, that fallyt on the gras. As dew in Aprille, that fallyt on the flour. As dew in Aprille, that fallyt on the spray. Wel may swych a lady Godes moder be. Well may such a Maiden, God’s mother be. Ah well, I still went to the website (which is fabulous) so I could read the whole poem and make sense out of the last line. I suppose that Middle English gets easier if one is exposed to it more often. I would only change one word from the above “translation” — “flour” should be translated as “flower.” Otherwise, good job. Thanks James in Perth. That is where I am also. I agree with your correction. And the last line should be “Well may such a Lady, God’s mother be.” Thanks again.